This little creature looks scarier in the photo than she did in person. 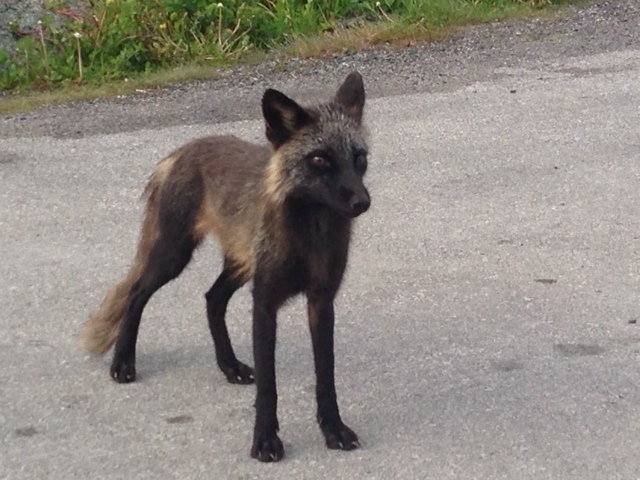 As with my recent friendly squirrel encounter in Toronto, we had this little fox, a small herd of caribou and an American crow walk up to us without fear. 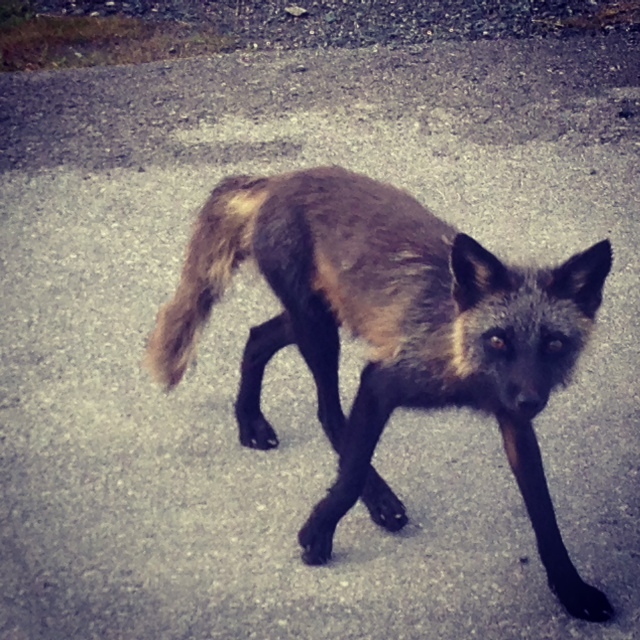 I had fear with the fox, but my curiosity got the better of me, even though I know approaching wild animals is as dangerous for me as it is for them. 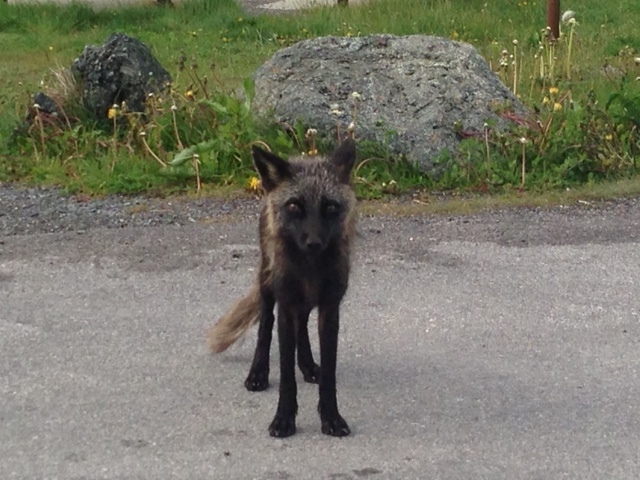 A variant of the red fox, she was young and thin, probably hanging out to scavenge from the humans who regularly visit the point in St. Anthony’s, Newfoundland to go whale and iceberg watching. That’s the only reason I could think of that made her so tame. I was charmed by the little creature but then cautious when she started walking towards me. She was not aggressive at all but seemed to expect something from me, like food. As I backed towards the car, I was ashamed because I had done what all stupid humans do: I showed her I was not dangerous. Although I didn’t toss food for her I thought about it. She’ll probably continue to get fed by others who feel sorry for her. At this time of year there should be plenty of small animals around for her to feed on but she’s learned how to scavenge. One day she’ll get hit by a car or behave like the wild animal she is and bite someone who doesn’t respect her wildness, just because she’s so cute. She needs to learn how to be a fox and not trust humans. We’re up to no good. Caribou, who with his other young herd-mates was very brave. Four or five carloads of people stopped to take photos of them in a nearby field. 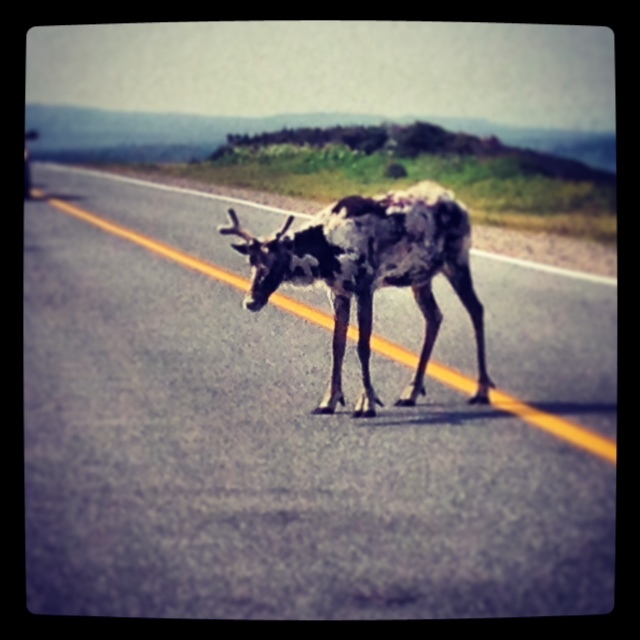 Within minutes they walked right up to us on the road, and this one intrepid fellow decided he felt like posing. He was within twenty feet of us in the middle of the road. Thankfully, all traffic stopped to let him decide what he was going to do. Then he left and rejoined his herd. This entry was posted in Animalia, Ramblings and tagged brown fox, caribou, guilty vegetarian, iceberg watching, Newfoundland, red fox, st. anthony's, veggie, whale watching by budbug. Bookmark the permalink.